It’s pretty inevitable that after eight years on the air, the freshness and zip in the writing and performing would have abated somewhat in any television show, and sadly that also applies to ABC’s Modern Family, still the network’s highest rated comedy series but one that is no longer the ratings powerhouse it once was. Run Time: 7 Hr. 54 Min. It’s pretty inevitable that after eight years on the air, the freshness and zip in the writing and performing would have abated somewhat in any television show, and sadly that also applies to ABC’s Modern Family, still the network’s highest rated comedy series but one that is no longer the ratings powerhouse it once was. In telling the continuing adventures of the Pritchett and Dunphy families, what was once so hilarious and unique often now relies on predictable comedy tropes and repetition. That isn’t to say there aren’t big laughs to be had in the eighth season; there are, but they come fewer and farther between the assorted chuckles, smiles, or flat out duds. It’s graduation year for Manny Delgado (Rico Rodriguez) and Luke Dunphy (Nolan Gould), so there is continual drama between the two boys: both run for student council president and then spend their senior year not only pursuing girls but also with different focuses: Manny in preparing for college (with every university where he applied offering him admission) and Luke in getting turned down by every college where he applied but feathering his nest by working at his grandfather’s club and earning huge tips from the privileged elites. Hayley Dunphy (Sarah Hyland) is fired from her job as a designer’s assistant and joins with her friends in a new business doing publicity for clubs and events on social media. She also begins a season-long relationship with local weatherman Rainer Shine (Nathan Fillion) though it’s clear it’s not going to be long lasting. Alex Dunphy (Ariel Winter) begins the year suffering with mono forcing her to take a leave of absence from Cal Tech and during her recuperation takes a job as a barista at a local coffee shop and beginning a new relationship with her mother’s personal assistant Ben (Joe Mande) before heading back to college. Some of the adults venture into continuing storylines, too. Jay Pritchett (Ed O’Neill) has fully retired from his closet company turning the reins of the business over to daughter Claire (Julie Bowen) which leaves him more opportunities to interact with patented impatience with son-in-law Phil (Ty Burrell), son Mitchell (Jesse Tyler Ferguson), and son-in-law Cameron Tucker (Eric Stonestreet). Jay and Phil embark on a business venture together: first in planning a new office complex called Dunphy Tower but after a succession of construction snafus, the dream turns into a parking lot (one of the season’s strongest episodes thanks to the sassy performance by lot attendant Niecy Nash). Cam and Mitch continue to plague one another with their neediness and insecurity while daughter Lily (Aubrey Anderson-Emmons) stands on the sidelines commenting drolly. This season, four holidays were celebrated: Halloween, Thanksgiving, New Year’s Eve, and Valentine’s Day, but despite the presence of Phil’s alter ego Clive Bixby in the Valentine’s Day program, none of them measured up to holiday celebration episodes from previous seasons. Phil’s father Frank (Fred Willard) begins a new relationship with Phil’s old baby sitter (Faith Prince) culminating in a later season wedding episode. In fact, the show went a little guest star happy this season. In addition to appearances by the aforementioned Nathan Fillion, Niecy Nash, Fred Willard, and Faith Prince, special guests this season also included Peyton Manning, Benjamin Bratt, Elizabeth Banks, Kelsey Grammer, Victor Garber, Oliver Platt, Dot-Marie Jones, Will Sasson, Jane Krakowski, Shelley Long, Charles Barkley, and DeAndre Jordan. The transfers retain the widescreen television aspect ratio of 1.78:1 from network broadcasts, and they are anamorphically enhanced for widescreen televisions. The episode transfers offer surprisingly superb sharpness for standard definition and color that is solid and consistently maintained. Contrast is likewise continuously well applied resulting in better than decent transfers nearly matching the 720p quality of the broadcast material especially if viewed on a good upscaling player. I noticed moiré in the Fox logos at the start of each disc but none whatsoever in any of the individual episodes. Each episode is divided into 5 chapters. The Dolby Digital 5.1 sound mix mirrors the broadcast quality of the program. It offers a solid encode for the show’s most important element: dialogue. It’s placed firmly in the center channel and has been expertly recorded. Occasionally, there are some fleeting uses of the fronts and rears for ambient sounds: music and voices in the school dance sequence in episode #9, a vehicle speeding past, and the like. Apart from the main title music, a background score is not really present in the series unless the characters enter a location which has piped-in music. 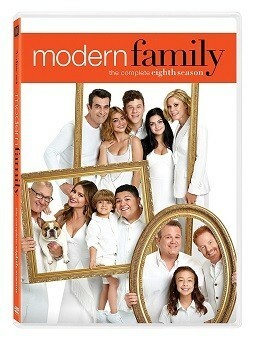 Despite the erosion in ratings, ABC still offered Modern Family a two-year renewal at the end of this season guaranteeing two more years of hijinks in the Pritchett and Dunphy clans. While Fox continues to disappoint by releasing this series only on DVD, a good upconverting player makes this year’s DVD transfers a grudgingly acceptable compromise to no Blu-ray release. Thanks, Matt. I enjoyed the season a bit more than you did. My wife and I still watch it every week. My biggest problem with the series is that the Dunphy kids aren't as appealing now that they're older and the show is better when they are minimized. Conversely, the girl who plays Lily is a terrific child actress and steals every scene she's in. Sadly I quit buying the releases when they moved to DVD only. But it is Fox so fans are lucky the show even gets a release. Watching the show on a weekly basis, I didn't notice any particular run of mediocre episodes, but watching all of them back-to-back over the course of three days brought out to me that it was a very uneven season for them. There are about four episodes that precede the Niecy Nash program that elicited nary a smile for the entire show, and for my history with Modern Family, that's very rare but indicative of the creative juices starting to slow. I had to laugh at that comment about the younger actors not being appealing any more with age. Are you suggesting that the show should get its own "Cousin Oliver"? Besides, there's Lily and Joe for the cuteness quotient. It'll be interesting to see how Manny and Luke make it in the outside world as Phil and Claire deal with the potential of an 'empty nest' in Season Nine. There are a lot of potential stories to be told there. Charles EllisI had to laugh at that comment about the younger actors not being appealing any more with age. Are you suggesting that the show should get its own "Cousin Oliver"? They already have their equivalent to Cousin Oliver and that is Joe. Sadly, I find him to be incredibly mediocre. Yeah, I know, he's only a kid, but I much prefer it when he's hardly used (or at least doesn't have a speaking part). If he doesn't improve, they should consider leaving him out almost entirely (just off-screen references or rare non-speaking scenes) or recasting. I guess he just doesn't have natural acting ability. Thankfully, the girl playing Lily has gotten really good at the acting thing. I, too, have stopped buying at Season 4, all because of the blu-ray thing. If Fox are going to pull that stunt, I'll just wait on the later seasons and snap them up at a flea market for five bucks apiece someday. The show certainly gets enough rerun play in my market that I'm definitely not starved for 'new' reruns. Too bad this isn't offered on blu in other territories like some CBS shows (like Hawaii Five-0). This show needs to end. If they had ended last year, they might have gone out with some dignity left. Now it's just another sitcom that started good but wore out its welcome.